iOS 6 has seen rapid adoption among iPhone and iPad users, reports developer David Smith. Smith’s applications like Audiobooks get around 100k downloads weekly and he’s taken to mapping the adoption of Apple’s software releases over the last couple of years. 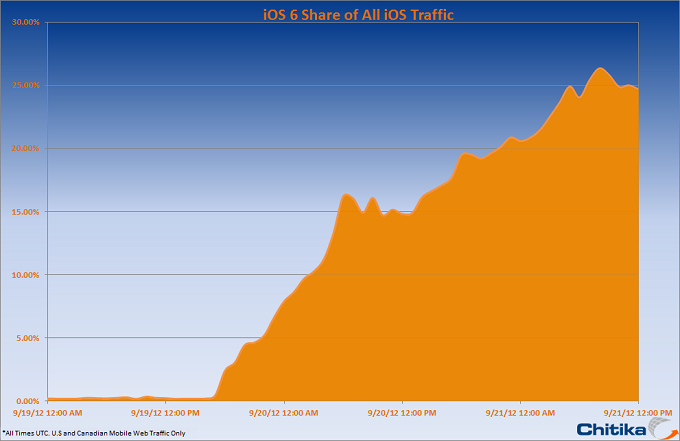 This update’s data shows a 35.4% adoption of iOS 6, with iOS 5.x holding court at 71.5% adoption. That’s a pretty rapid pace, eclipsing Android Jelly Bean’s 2-month adoption levels of 1.2% easily. Chitika says that iOS 5 took some 21 days to hit the 21% mark. iOS 6 is the first major iOS update that will be downloadable over-the-air. iOS 5 supports delta updates, patching only the changed parts of the OS for smaller downloads, but upgrading from iOS 4.x to 5.0 had to be done with a cable and a computer. Users of iOS 5 will be able to make the jump without ever having to touch a computer. Plug it in to charge, hit the update button and give it 30 minutes and you’re up and running. It’s going to push the adoption rates of iOS 6 into the stratosphere. Apple has already had very good luck with upgrades due to a small overall device footprint, with iOS 5.0 hitting 75% in a few weeks and iOS 5.1 nearing 61% adoption in just 15 days. With iOS 6 being the first completely native OTA experience, these rates are going to be blown away. And it looks like iOS 6 is on track to do just that. Somewhat ironically, Android users have enjoyed over-the-air updates for some time, but due to carrier and manufacturer meddling, their update rates are terrible.